Whether it’s getting the hang of “tiller toward trouble” in an Optimist or learning the feel of the wheel on a keelboat, one of the first things that a beginner sailor learns is how to steer the boat with the rudder. However, using the rudder is not the only way to steer. In fact, because every movement of the rudder creates drag that slows a boat’s progress, you’re slowing yourself down every time you move the rudder. Many sailors don’t realize that adjusting sails and weight also affects their steering. If you’re racing, you’ll want to minimize drag and learn to steer with your sails and weight. Even if you don’t plan to race, it’s helpful to understand how sails and weight affect steering and be able to use these tools to your advantage. Picture a bird’s eye view of a boat sailing a beam reach, with a large “X” painted on the deck directly above the keel or centerboard, just aft of the mast. This X marks a point that the bow and stern rotate around (a physics teacher would describe this as the fulcrum of a first degree lever). As you’re watching, the crew trims the jib but does not adjust the main, causing additional pressure on the bow of the boat. As a result, the bow is pushed down, pivoting around the X, and the stern looks like the opposite side of a seesaw – it moves up. The sailors onboard see that their course has changed – although the helmsperson did not move the rudder, they’re now sailing a lower course than they had been. If the sailors had overtrimmed the mainsail or eased the jib, the seesaw would have gone the other way and they would’ve headed up. Weight placement also affects a boat’s path through the water. A perfectly flat boat will sail straight forward. A boat that is not in balance, however, will veer to one side or the other. Continue watching our imaginary boat, but from a motorboat directly behind. The sailors shift their weight to leeward and the boat heels over. As it heels, it spins to windward, heading up. Once the crew flattens the boat, it steadies out onto a straight course, but if they overflatten and the boat heels to windward, you notice that the bow points down slightly. If you’ve ever tried to round a windward mark in heavy breeze and had a hard time bearing off, it was probably because your heel was counteracting your rudder movement. Next time, try easing your sails to depower and flatten your boat – overflatten if you can – and you’ll find that bearing off is much more effective and controllable. Remember to steer with your sails by keeping your jib a touch overtrimmed and your main eased as you bear away. As you round the leeward mark at the end of the run, heel your boat to leeward, trim your main in quickly, and keep your jib eased just a touch for a smooth rounding. The best way to demonstrate the effects of your sails and weight on steering is to go out and experiment. Smaller boats tend to be more responsive than larger ones; a two-person dinghy like a 420, Pixel or JY-15 is ideal for this exercise. Find an area without any major obstructions, so you can focus on boathandling. Remember: main in and/or heel to leeward to head up, jib in and/or heel to windward to bear off. First, try sailing with only the main or the jib. (It’s possible to sail rudderless on a singlehander like a Laser, though it’s slightly more difficult.) You should immediately notice that the boat feels out of balance. You won’t be able to trim your one sail all the way in, but you should be able to find a point where you can balance the boat and sail a straight line. Once you’ve mastered sailing with only the main and only the jib, remove your rudder (or tie it in place so it’ll stay perfectly centered). It’s very important that when you sail rudderless you also pull your centerboard halfway up – your boat will be too responsive if you don’t. Don’t be afraid if it feels like you’re spinning out of control at first – sailing rudderless is like riding a bicycle without training wheels – once you figure out how to balance, a whole new world opens up. The more you sail without a rudder, the more aware you’ll be of how weight placement is affecting the boat and what small sail trim adjustments can do…and how vital communication and teamwork can be. Many sailors disregard boathandling and don’t try steering with their weight and sails, figuring that small gains in speed don’t help you get a good start or pick the right side of the course. But how many times have you wished you had just a boatlength or two more on your competitors at a mark or finish line? Steering with your weight and sails can help you get there. 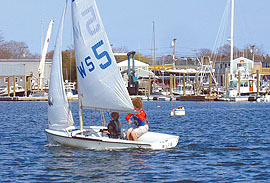 Clemmie Everett teaches History at The Williams School in New London, CT and coaches the school’s varsity sailing team. A Past Commodore of the Harvard University Sailing Team, she’s a member of American Yacht Club, where she races RS K6s. A resident of Mystic, CT, she is also an instructor at Ram Island Yacht Club.